As you could probably surmise from the length of my last post, I'm not only into techie geeky stuff, I also love to write. Since I was a boy I've always loved telling stories. It's what I did then (with my toys, friends and Dad's old typewriter he had in the office) and what I still do today (less toys, better friends that also write, and many, many word processors). Though the platforms I use have changed drastically and will continue to do so, the spirit of it all still very much there. So what do I like to write? I typically write fiction of a darker tone, focusing a lot on Horror and Science Fiction. I'm pretty much always in the middle of writing something novel-length that I'll inevitably have a hard time finishing. But as much as I love writing and telling stories, I've also been falling in love with the process of writing as well. More specifically, the tools that are available to all of us today. So, with this in mind, I thought I would take some time to describe my current writing system to you all. My hope is that might inspire some to write more often and in more places. Because inspiration can happen anywhere! A 2011 Mac Mini in the office. 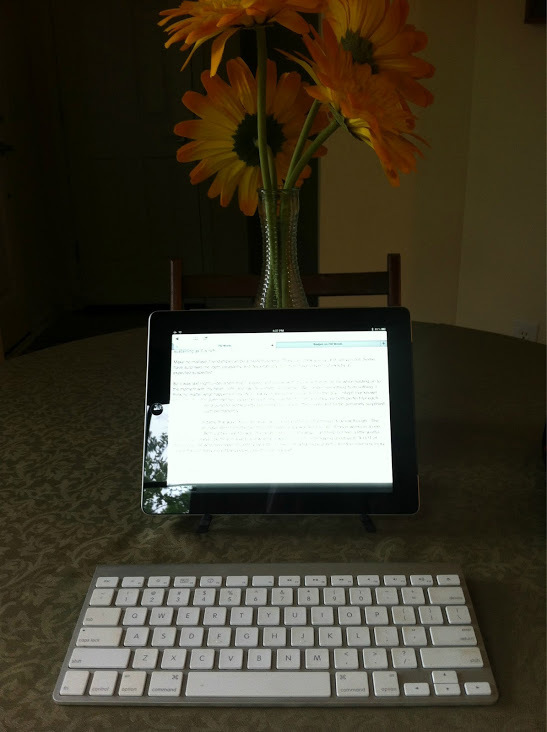 An iPad (3rd gen) for writing remotely. Had a laptop, the iPad replaced it recently. I also use a stand and an Apple bluetooth keyboard. When I'm home, I generally use the Mini, it's a little powerhouse, has much bigger screen and has a full size keyboard. All make for easier writing in general. When I am out and about and I know that I am going to write, I'll bring my iPad setup. 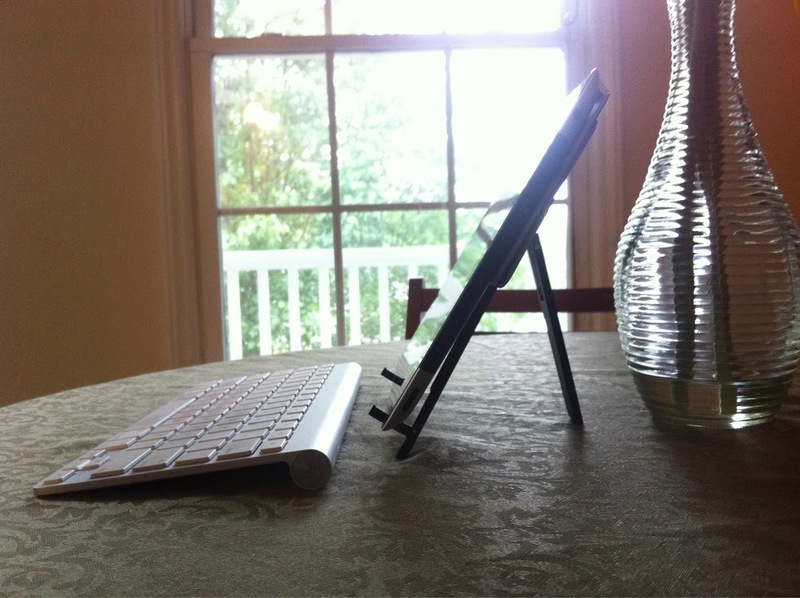 This consists of the iPad, a stand (The Compass by TwelveSouth) and Apple's bluetooth keyboard. Otherwise, I always have my phone on me, so note taking or even full on writing is always at hand. Though, admittedly, it's tough to pull off a full-on jag of writing on an iPhone, I have done it a few times, which to me is kind of amazing. So that's the hardware involved. I've yet to have a serious problem with this setup. In fact, in the last year I paired down a good bit of my setup when it became clear I could supplement my iPad for a laptop with very little sacrifice. But we all know that hardware is only as good as the software you run on it, so here are the tools of my trade, as well as the two scenarios I constantly run into that they accommodate. First Scenario: I know that I am going to be writing on my iPad in the morning, finishing up a thought on my iPhone during my commute and tidying up on the computer (iMac) in my office. One document, on 3 separate devices, saved and synced each time. This little gem of an app utilizes Apple's iCloud service to sync between all of the above devices almost instantaneously. It's pretty amazing to watch actually, and I've yet to see it fail. Not even once. Because it works so well, I've come to rely on this first system 75% of the time. It saves your files in text format or in straight up markdown (which is quite handy for blogging). While it's preferences are basically non-existent (it's a focus-based text editor), it performs it's function, letting you write, quite well. I do wish it had better sharing options but there are a lot of easy ways around this. All versions of this app are full screen and very easy to read, leaving just you, the screen, and your words. Highly recommended and a silver bullet solution to the scenario above. Second Scenario: I know I'll be writing on any platform on the planet, PC, MAC, Unix, iOS, Android, etc… and will need to edit it on my iOS or OSX device later. Solution: Elements for Dropbox (iOS-based) and a free Dropbox account for cloud storage along with the free corresponding Dropbox iOS apps (also found for Android devices as well). If you have an iOS device and any kind of computer the solution above works great! It's not as streamlined as the first solution but it isn't difficult and it achieves the same result. 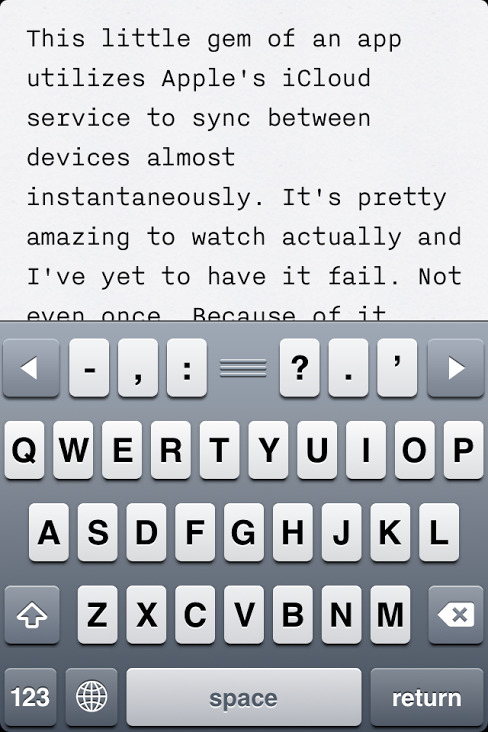 Your writing will be synced and available across multiple devices. In fact, I have to hand it to Dropbox. Their service/product alone has enabled SO many opportunities to folks who need mobile cloud-based storage it's pretty amazing. This solution worked perfect for me the other day when I was working on a text file at the office on my PC. When I was done, I saved it to my Dropbox account and headed out. I had some time at a coffee shop a bit later and fired up my iPhone to edit it more there, once complete, I synced it with Dropbox again and headed home where it was waiting for me to edit on my Mac with any text editor I had at my disposal. Easy peasey! Elements is also a WAY more robust and full featured editor compared to iA Writer, which is incredibly spartan intentionally by design. I've used Elements for many other text editing functions other than writing. I've actually coded web sites in it on my iPad! Lots of options and very easy to use. In fact, if it supported iCloud sync and had a corresponding Mac app, I would be inclined to ditch iA Writer entirely and just use Elements. It's that good. But both text editors are superb, they just were built for different purposes that's all. I whole heartedly recommend one or both of the solutions above for your writing. I currently use both weekly (sometimes daily depending on my needs). Hopefully it will encourage you to write more, in more locations and give you less excuses not too. Also, if you are even remotely interested in an exhaustive list of all of the text editors available on the iOS platform, I recommend checking out this incredibly thorough article by Brett Terpstra. I can't even imagine the time it must've taken to put this together. Lastly, the very popular tech site "The Verge" just recently did a post about this very topic! So if you are looking for another take on all of this. Check it out here..
UPDATE: One of my favorite Mac and tech writers out there, Federico Viticci, literally today (04/27/12) just posted a very in depth article about his personal writing workflow as well! Be sure to check it out here. Thanks for stopping by! Hopefully you found this useful!